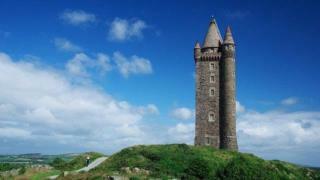 Scrabo Tower, one of Northern Ireland's most iconic landmarks, has been closed to the public. The Northern Ireland Environment Agency (NIEA) said the tower, near Newtownards, County Down, would be closed for the "foreseeable future". A spokesperson said water had damaged the tower's electrical supply and lighting. The tower was built in 1857 as a memorial to Charles Stewart, third Marquess of Londonderry. The tower is a popular tourist attraction, with visitors able to climb 122 steps to its summit. However, the NIEA said they have been forced to close the tower due to repeated water damage to the electrical system. A spokesperson said: "The NIEA has, very reluctantly, decided not to routinely open Scrabo Tower to the public for the foreseeable future. "Its exposed location makes the tower very vulnerable to wet and windy weather. "The Department of Environment has carried out works costing hundreds of thousands of pounds over the last 30 years. "Despite this, the tower continues to suffer serious water ingress. "For the second time in five years, this has damaged the electrical supply and lighting. "Without lighting, the safety of visitors would be compromised." The NIEA said they are seeking specialist advice on weatherproofing the tower and replacing the lighting supply. The agency also said the tower may open for special occasions if it is considered safe.